'Mechs vs Minions' is a hoot and a half, even for people who don't play the video game it's based on. Mechs vs Minions is League of Legends fanfiction presented in the style of Dungeons & Dragons or Descent, with just a hint of Fireball Island thrown in for good measure. It's a cooperative, programmable, card-wielding board game set in the League universe, starring League characters, but nothing about it feels shoehorned into a tabletop format. This could easily be a standalone game on the shelf at Target, no outside video game connection required. 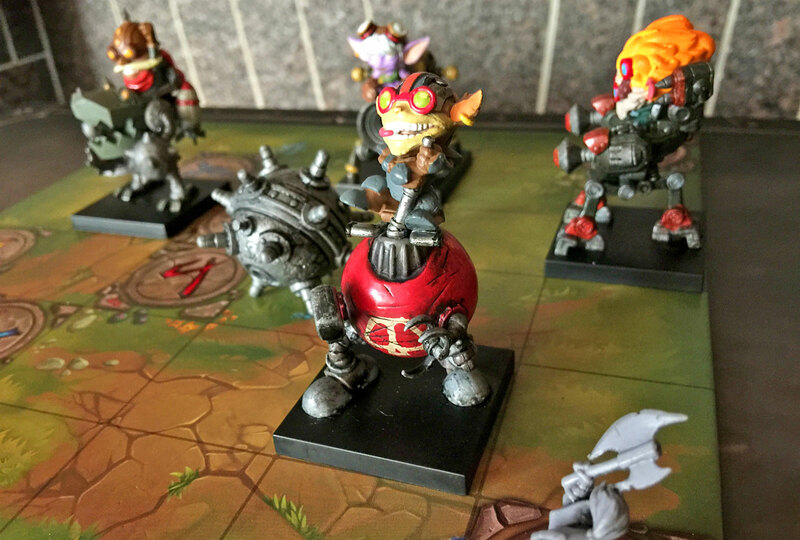 That said, the aspects of Mechs vs Minions that reference League make the game exponentially more special for fans of the video game -- and, let's face it, there are a lot of League fans. More than 100 million people around the world play the game every month and SuperData Research estimates that its studio, Riot Games, will pull in revenue of nearly $1.8 billion in 2016. Part of that cash influx comes from Riot's eSports efforts, which are in full swing this weekend: The League of Legends World Championship concludes on Saturday at the Los Angeles Staples Center, which has sold out (again) for the final global showdown. But, that's all just background information for the board game, which we unboxed live on Facebook on Friday. Mechs vs Minions is a cooperative tabletop experience designed for two to four players, who all work together to defeat hordes of minions and complete dangerous missions. 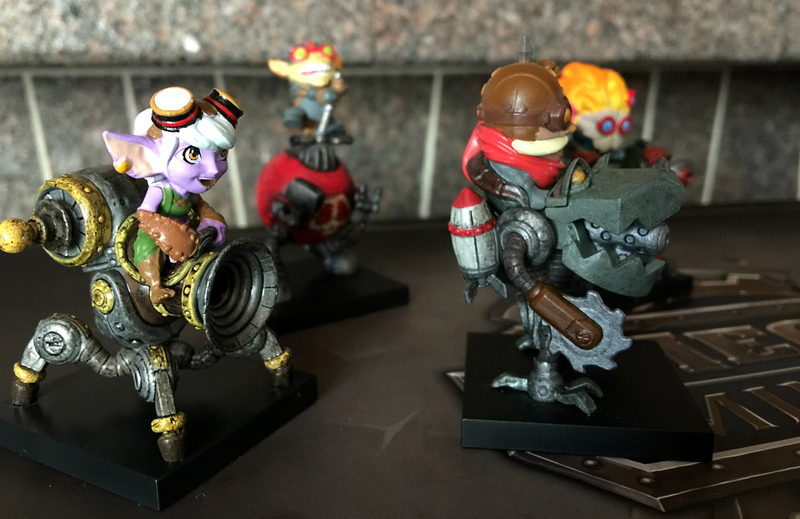 The stars are Tristana, Corki, Ziggs and Heimerdinger, all of whom are yordles (short, furry, cartoonish creatures) plucked directly from League. The map comes in five pieces to accommodate a plethora of mission designs, and players move around by slotting cards into their command lines -- basically, these are long boards with six card-shaped slots. Each player gets her own command line and is able to customize it to make the associated character move, attack and transport packages across the map. It's like programming; once the cards are slotted in, each player has to execute the entire line, in order, on each turn. Figuring out where to put action cards in relation to movement cards is half of the battle (and the fun). However, minions and other hazards can make the command line messy. Players take damage when they're next to minions and other explosive objects, which means they pick up a damage card. These cards are either placed on top of a slot in a player's command line, mucking up the program until the player uses a turn to get rid of it, or they're used right away, forcing players to move cards around their command line and generally throwing off their groove. These are just the basics of Mechs vs Minions gameplay. The full game is $75 and it comes with 100 minions, four yordles, a large boss statue, five map pieces, nearly 200 cards, a tiny bomb figurine, and 10 mission envelopes, each offering a different way to play and new foes to defeat, and of course a dense rulebook and tutorial guide. This isn't exactly a pick-up-and-play kind of tabletop game -- it takes a little bit of studying and at least one practice round to get fully acquainted with its rhythms, but it's absolutely worthwhile for League fans (and their long-suffering friends).